A couple of years ago, as part of my own personal coaching experiment, I strolled into Starbucks, got my favorite coffee, and settled in for some people watching. Normally I spend my Starbucks time happily engrossed either in writing or reading, but for this day, I was willing to set aside my books and pens and just watch. Why? I was in the process of researching one of my elusive dreams – my very own happily ever after, the one where I’m thin and – therefore – my life is filled with magical goodness. My thin fantasy self has been with me forever, and I have to tell you, her life is pretty incredible. Things are so easy for her. She has oodles of self-confidence. Her skin is glowing, she looks incredible in everything she wears, and she loves getting mani/pedis and does so weekly. Her hair is effortlessly perfect. She loves wearing heels and stops traffic when she does – she’s just that hot. Men flock to her in droves, wanting to take her on exciting dates. She can’t even walk down the street without being asked out repeatedly. She’s a delight on dates – outgoing, with a sparkling wit and easy grace. Men who didn’t love her when she was fat (and normally go for other men) fall hopelessly in love with her. Music spontaneously plays when she enters or exits a scene. Her crowning glory? Her existence was evidence that I was done with ‘my issues.’ For years I had convinced myself that once I was emotionally well, I would naturally become thin. My thin self would be proof to the entire world that I was okay. 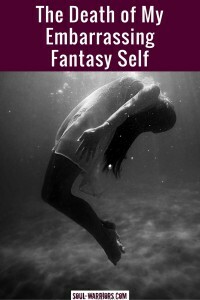 My thin alter ego has been the most powerful, persistent happily-ever-after fantasy of my life. Did it matter that I’ve actually been thin and none of that happened and my life really sucked? No. Did it matter that I’d done 15 years of personal growth work and knew in my bones that magical goodness comes from within, not without? No. Did it matter that I had tons of evidence of thin people around me who still struggled with self-confidence, stayed in abusive relationships, hated their jobs, and faced the same (or worse) challenges that I do every day and their thinness did not somehow erase those problems? Nope – not at all. Did it matter that one of my happily-ever-after dreams came true – I found my purpose – and it was not the wild panacea I had believed it to be? Yes, that one did. It opened up a little bit of space for me to question the magical powers of this thin self. The second crack in her power came when I did enough work around love that my desperate desire to find a soul mate simmered to a grounded openness to creating a beautiful partnership. That initial desperate longing had the same feeling of grasping, “then-everything-will-be-perfect” that my thin fantasies did. Soon I had enough room to really start questioning some of these ideas. Was it true that I would magically lose weight once I was ‘emotionally healthy’? Weren’t daily happiness, the ability to process my emotions freely, courage to deal with interpersonal conflict, and commitment to facing anything necessary for my own well-being better indicators of emotional health than my weight? This freed me to seek out a coach who specialized in intuitive eating and body image issues. I introduced her to my thin fantasy self and – after she finally stopped laughing – she challenged me by asking if maybe my thin self weren’t an obstacle to weight loss instead of an incentive. Now, you don’t know me, so I feel compelled to point out that – despite my thin fantasy self – I’m neither outrageously arrogant nor completely clueless about reality. I understand that weight loss does not generate a spontaneous soundtrack, and that, no matter my weight, I will still be an average-looking middle-aged woman with plain nails and flat hair. 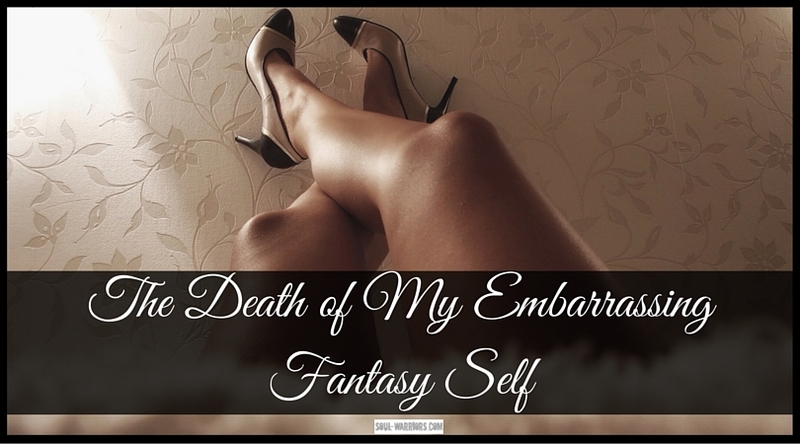 I’m sharing this embarrassing story with you to acknowledge just how powerful and seductive the happily-ever-after fantasy can be. Most of us – no matter how much therapy we’ve done – are vulnerable to its power, because we want it to be true. I want a magic solution that makes me into a mani/pedi-loving, traffic-stopping, perfect-haired supermodel. Just like I wanted to find my purpose so I could quit my horrible job and feel like my life had meaning. Just like I wanted to find my soul mate who would sweep me off my feet and solve all my problems. Just like I wanted to win the lottery so I could get out of debt and start a nonprofit. Let’s return to Starbucks, now that you know the context. So there I was, giving up my reading time – not to handle the rush of swooning men, but to observe thin women as they navigated their morning coffee time. Soon enough, a drop-dead gorgeous (like, traffic-stopping gorgeous and of course, thin) woman came in and waited for the barista to make her coffee. Want to know what the ten men sitting in her vicinity did as she waited for her drink? Nothing. Absolutely nothing – none of them even looked up from their screens. Granted, I live in Los Angeles, where it’s not uncommon to see at least one stunning-according-to-current-cultural-norms woman per day, because this is where they come to work. But come on! My thin fantasy self deflated with this, like she had lost a superpower. No hordes of swooning men. That meant that after I had done the work of getting thin, I still had to do the work of learning how to flirt and meet people while I was out and about. It probably meant I still had to suffer through pedicures and learn to style my hair if I didn’t just want it to be flat. How disappointing does it get? You would think that after this sad dethroning, my thin fantasy self slunk into a corner, like Oz after the curtain was pulled, right? Wrong. She hung around. She kept tempting me and despite being on to her, I still dreamed of being her. Finally, I figured out that she had a reason for being – she was a powerful messenger for me, and she wasn’t going to vanish until I had learned what she wanted to teach me. 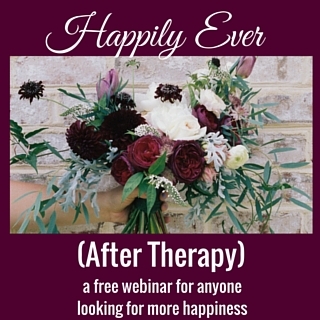 I’ll be sharing what she taught me specifically and what the whole experience taught me about our collective happily-ever-after dreams this Saturday, March 5th, in the Happily Ever (After Therapy) webinar. As I’m already past 1200 words in just this post, you can tell I have a lot to say on this topic! That’s why I am hosting the webinar – so we have a full hour of time to walk through these ideas and see how they apply to your life. For the last month, I’ve been sharing client stories and promising their resolution on this webinar. That’s because each of them – even though the stories are very different – share the same root cause. That is the core of what we will be going through during our hour together – why these happily-ever-after dreams are so seductive and what they are trying to teach us. You can learn more about the webinar and sign up here. Looking forward to seeing you there! I loved this blog. It was laughing out loud funny. Look forward to your webinar. Thank you!! So glad you enjoyed it – see you on the Webinar!